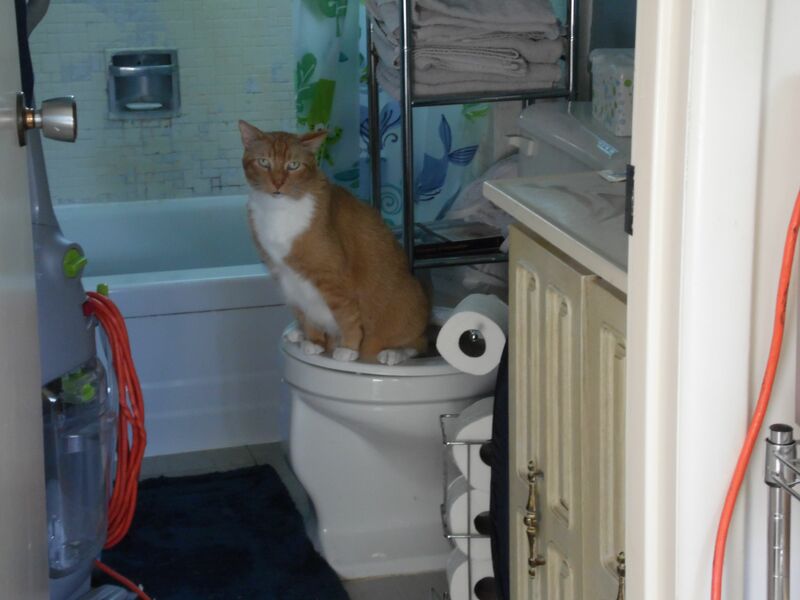 How and Why I Toilet Trained My Cat. We had company visiting and while we were chatting my cat walked by to the bathroom and then a few minutes later walked back, meowed at me, and left. I excused myself to go flush for him. My guests were amazed. “Your cat uses the toilet?” This led to a discussion about how and why I toilet trained my cat and never spend a penny on kitty litter or time cleaning the litter pan. Why was easy. Klinger had gotten separated from us and was gone for 8 weeks before we got him back. During that eight weeks I got really comfy with not cleaning the litter box and while it was good to have him back, I found I really resented having to clean that box again. I have asthma and artificial scents and fine dust make me wheeze. I found it was getting harder and harder to find kitty litter that was not full of stuff that makes me wheeze. Bad enough you have the natural dust but all that “fresh air” scent crap they add to cover the dirty litter box smell leaves me with watering eyes and a cough. So that was one reason. And there was the cost. I didn’t really consider the cost until I started collecting the buckets and using them to make a container garden. That really hit hard. I had a whole bunch of these buckets each one representing about $12 and so that meant I was spending over $600 a year on kitty litter! You don’t think its all that much but add it up over time. I can certainly think of a lot of things I’d rather spend $600 on. That was the second reason. Then there is the environmental cost. Kitty litter is made of clay which has to be strip mined off the face of poor mother earth. The litter then mostly ends up landfills. Do I really want to be involved in that kind of recycling? No. That was the third reason. So how did we do it? It was easy and hard. It was easy because the steps are simple and straightforward. You don’t try to train the cat all at once. You do it very slowly adding teeny tiny increments until the cat can do it. It was hard because you have to be SO patient while doing those teeny tiny increments. You also have to put up with accidents while learning. It helps to think of accidents as being your fault. An accident means you moved to quickly or made a step too big for the cat. The steps are available from many excellent on line websites and you tube videos so I won’t detail them here. In summary you start by moving the litter box to beside the toilet for about a week. You then raise the litter a bit (about 15 cm or 6 inches) at a time leaving the litter box at each level for about a week. (Yes it is awkward putting up with the litter box by the toilet. It IS temporary and it IS worth it.) Once you have the litter box at the same level as the toilet and the cat is accustomed to jumping up to that height, you move the litter box over onto the toilet. You now have to put up with a week of moving the litter box every time you need to use the toilet but bear with me. The next few steps are the trickiest ones and there are various ways of doing it including a neat commercial kit. I used a big bowl I had that happened to sit very nicely in the toilet and was easy to move off and on when I needed to use the thing. You get the litter down to under the toilet seat. The first time Klinger found the litter suddenly under the toilet seat he walked around and around, checked very carefully, tried to get into the small circle and failed. He then gave a cat shrug and balanced on the seat, did his business, covered it and left. This step represents a major hurdle. Some people start by putting a separate toilet seat over the litter box at floor level because of this. Once the cat is reliably using the litter in the bowl while squatting on the seat you can start slowly, very slowly, reducing the amount of litter and increasing the depth of the litter. The cute commercial thing actually has a centre hole that can be adjusted larger and larger. I kept reducing the litter in the bowl until I had none and then I let him get used to using it dry. Because we were living in the trailer when I did this, he didn’t have to learn over water. I did one other thing which I think helped. Mother cats train their babies to bury their waste. I think Klinger regards me as a mother figure so whenever I used the toilet I would invite him in and encourage him to watch me. After I was done I would put him on the toilet seat so he could see and smell. He did seem to “get” what I was up to. Klinger also responds to rewards of cat nip, praise and a nice ear rub. Every time he did something right he got lots of praise for it. Over all it took about 8 weeks until he was reliably using the toilet. He went through a period where he started using the bathtub instead, when we first moved into the house, because he didn’t like the water in the regular stick house toilet. I had to keep the bathtub full with a layer of water to get him to get over that. I actually saw him when he found the tub full of water. I could see his cat brain working. Hm tub with lots of water and no perch or toilet with only a little water and a perch. Toilet it is. One other tip is we removed the toilet lid. He can’t lift the lid up by himself and it’s not fair to leave him in that fix. And that’s how and why I toilet trained my cat. One funny note: One of my guests asked if the cat didn’t leave a mess I was worried about sitting in. The answer is no and if you look at the picture you can see why. When the cat is squatting on the seat all his equipment is well below. The cat leaves a lot less mess than a typical man! And he doesn’t leave the toilet seat up either. The women all laughed and the men all kind of squirmed and rolled their eyes. This entry was posted in Frugal living and tagged cats, pets, Rural living on June 5, 2015 by tumbleweedstumbling. 🙂 BTW. I’m back after a 2 week trip to Poland. I traveled with, (not as a singer), the Kapelle choir from Concordia University Chicago. Jen came for a week. Krakow, Auschwitz, Pszczyna, Warsaw, Gniezno, Biskupinie, Poznan, Bedguous, Zary., with the choir singing in various churches and gatherings. (I may have misspelled some of the city names.) Many lengthy, moving, walking tours. Adjusting to being back, but had a wonderful time. Educational, emotionally moving, good exercise, good food. Many photos to sort out. Love this — and the cat doesn’t leave the toilet seat up. 🙂 Fwiw, our very earth conscious cat owning friend raves about this new kind of litter made from walnut shells. No weird fragrance added, and her house doesn’t smell lime litterbox at all. Sounds like a wonderful trip. I haven’t been to Poland and I’d love to hear your impressions. It is nice to stay in touch.